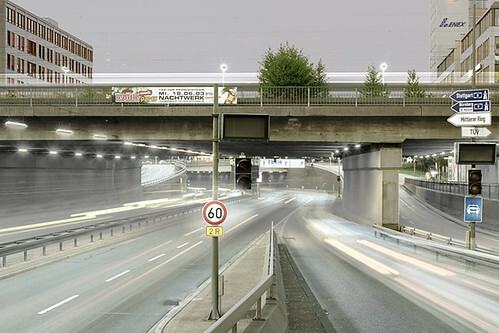 [Image: Thomas Weinberger, "Zone 60", München 2003]. Munich-based photographer Thomas Weinberger has a radiantly beautiful series of industrial and infrastructural landscape photographs called synthesen. The images are otherworldly, Ballardian, gemlike. The thick, almost surreal dimensionality of their lighting comes from Weinberger's technique, which is to combine two different photographs of the same scene – one taken during the day, one taken at night. His shot "Nizza" (2004), for instance, almost literally glows, the city burning with a white light as if liquid chrome has drowned the streets; while "Alexanderplatz" (Berlin, 2003) makes the Kaufhof look stroboscopically frozen, even extraplanetary or ossified. Then there's "Cracker" (2003), where we're greeted with an ESSO gas refinery in Ingolstadt – down to its shining vortices of pressure tubes and valving. "Zone 30" (Munich, 2004) looks like the opening shot of a sci-fi thriller about radiation poisoning in suburban Germany... Etc. The crispness – and gleaming, semi-symmetrical intricacy – of the shots totally amazes me. 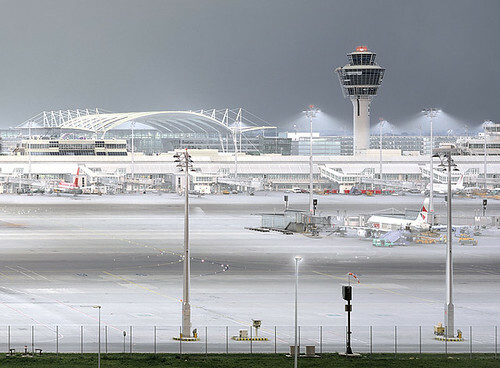 [Image: Thomas Weinberger, "Flughafen München" 2003]. Readers of German can download five short reviews of Weinberger's work; everyone else can just visit his website and gape. (Discovered via Alexander Trevi and juniorbonner; also seen at Conscientious, kottke.org, things magazine – and so on. For photos of a very vague aesthetic similarity see The Total Horizon). We're used to seeing that sort of industrial lighting as orange. He transforms it into silver.